My 1st moteif attempt. 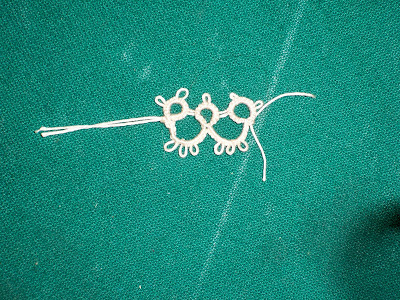 on the left side I twisted my chain but had it figured out on the right side but I messed up and did a ring instead of a chain over on the far left. But i think I'm headed in the right direction. 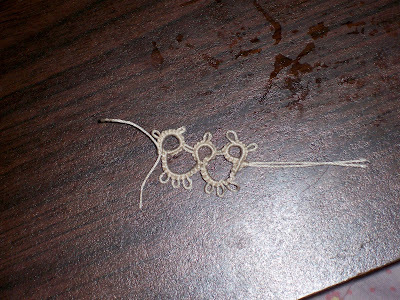 so this is my 1st attempt at tatting. 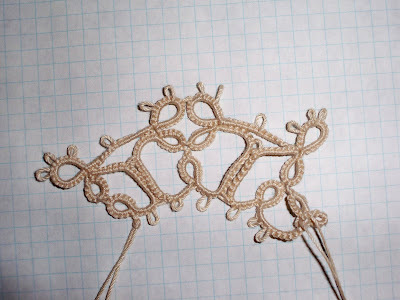 I used size 10 thread just for testers. A great first step! Now onward to the next step! That's a very impressive first step! It looks so perfect - every stitch in place. Precision stuff! Thank you! I picked up the shuttle a long time ago but put it right back down because i just didn't click with me though I admire the work and then I had someone sit down when seeing me do my curtains and ask me about tatting and my Dad had also asked if i still had my Great Great Aunt's supplies so I figured it's about time. 10 defiantly helps you see what you are doing. I seem to have jumped from 10 to 60 though, probably not the most recommended jump in thread size! Good thing my eyes are good!